All bedrooms en-suite with balcony or terrace and sea views. Large Master bedroom has en-suite bathroom and 2 terraces with sea views. Situated in the excellently situated Seaside Residence complex which is positioned right on the Calis seafront, with 3 shared swimming pools & children's pool, this villa is just steps away from one of the shared pools and comes complete with it’s own small landscaped garden. Seaside complex is set in beautifully landscaped gardens within this small gated community and has 24 hour on site Security. The Villa is fully air conditioned for comfort and includes heating if the weather turns cooler. There are mosquito screens fitted to all doors and windows. The lounge and bedrooms all have large sliding patio doors onto good sized terraces or balcony. Bedlinen, quilts and big fluffy towels are included. Sun-loungers with cushions and outside tables and chairs are included also. The master bedroom has a king size bed and there are 2 open sun terraces to this room also. The villa is tastefully and comfortably furnished and we hope has a home from home atmosphere. Turkey is a paradise of sun, sea, mountains, and lakes that offers the vacationer a complete change from the stress and routine of everyday life. From April to October, most places in Turkey have an ideal climate that is perfect for relaxing on sandy beaches or enjoying the tranquility of mountains and lakes. Turkey also has a magnificent past, and is a land full of historic treasures from 13 successive civilizations spanning 10,000 years. The Mediterranean or Turquoise Coast is a beautiful stretch of coastline and holiday haven, where welcoming resorts with top-class facilities and varied entertainment sit perfectly with beautiful natural landscapes and ancient history. Seaside Residence is right on the Mediterranean coast. Fethiye is located on the South Western tip of Turkey on the shores of the Mediterranean Sea. When viewed from the sea it is back dropped by the Taurus mountain range and in particular Mendos and Babadag mountains. In the winter these mountains are often snow capped which adds to the beauty. The bay is a natural safe harbour for ships and the marina in Fethiye is a popular stopping off point for leisure craft. Fethiye is a lively working Turkish town, great restaurants, good shopping mixed with some fascinating historical & cultural sites. 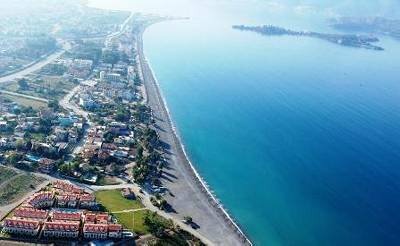 Calis is 5 kilometres north of Fethiye. It’s beach is a wide swathe of sand and pebble that stretches for over four kilometres, stretching down the coast past Kargi and onto Yaniklar. The promenade hosts many excellent restaurants and bars all with lovely views over the bay inlets out to sea. It is a laid back resort with something for everyone, great for families children are welcome almost everywhere and great for adults seeking sun and entertainment. Calis is famous for its stunning sunsets and its cooling summer breeze. Whether its sitting in a waterfront café sipping a cup of strong black Turkish coffee in Fethiye or simply lazing on the beach at Calis, these resorts personify relaxation. Calis Beach - of course right on your doorstep. A 4km arc of beautiful Mediterranean coastline for you to enjoy & explore. Ciflik Beach - just 2 or 3 miles up the road toward Dalaman, a quiet beach, with a gentle slope into the clear, cool waters. Katranci Beach - just a little further down the road towards Dalaman, another little gem just off the beaten track, a car is required. The hilltops are covered with red pines, eucalyptus tress and Cyprus acacias. From the pathway along the shoreline, crossing over the hill, the Kizlar cove is reached. These coves are very peaceful, very much like the old Turkey, not many tourists. Olu Deniz - a resort area and World Heritage site, especially the main hillside town of Belcekiz, which has crystal clear water, and a long, mostly shingle small stones beach curving away from the town promenade. The promenade by the town has plenty of bars, restaurants and cafés and there are loads of umbrellas and loungers for hire, and a wide range of water sports available. Paragliding and Hand gliding, solo or tandem, off the adjacent mountain and landing on the beach are extremely popular, as is scuba diving. Please note: As with any holiday abroad it is advisable that you take out holiday insurance including medical cover for your stay in Turkey. All en-suite bedrooms have stunning sea and mountain views. Outside Barbecue on terrace facing garden. Parking on road outside Seaside Residence.